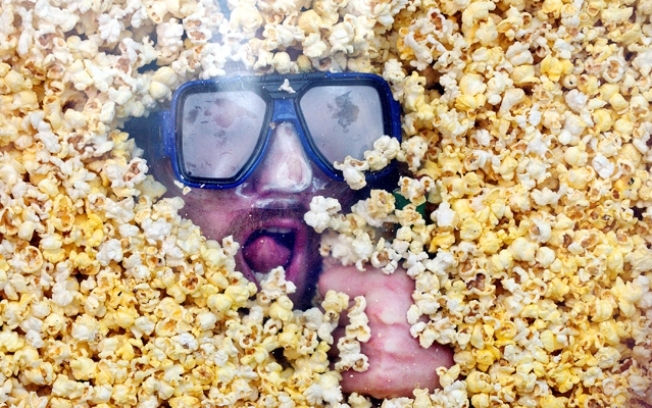 A man loves his popcorn so much he decides to don the goggles and go for a swim. How does curry coconut with cashews flavored popcorn sound? Exotic? We think so. San Francisco based popcorn maker 479 Degrees is hoping designer popcorn is up your alley. For $33 you too could have Piemnton de la Vera with smoked paprika delivered to your home. "Over the years, I experimented with making my own organic popcorn and flavoring it with exotic seasonings inspired by my international upbringing and training at Le Cordon Bleu in London," said Jean Arnold, Founder of 479° Popcorn. "In the process, I came upon the discovery that 479 degrees Fahrenheit is the optimal temperature for popping corn. I knew immediately that this would be the name of my popcorn company, because it reflects the careful attention to detail that I work so hard to incorporate into every single element of the business, from the pristine ingredients to the beautiful packaging to the avid dedication to customer satisfaction." The company makes the popcorn in small batches in a variety of flavors and allows you to order i directly from their Web site. Prices vary from $7.50 to $52 and it is also sold at various stores across the Bay Area. The company has a cool Web site that features all their interesting flavors. It is definitely worth checking out.